These photographs are from my family collection. They were mostly taken in the 1950s, and show the early stages of the rebuilding of Coventry Cathedral following the devastation caused by enemy bombs on night of November 14th, 1940. Click on the photos to view larger versions of these images. To read more about the bombing of Coventry Cathedral during the Blitz, see my page about Operation Moonlight Sonata. To view the full size versions of the photographs on this page, simply click them. This first photograph is labelled by the photographer as having been taken in 1952. 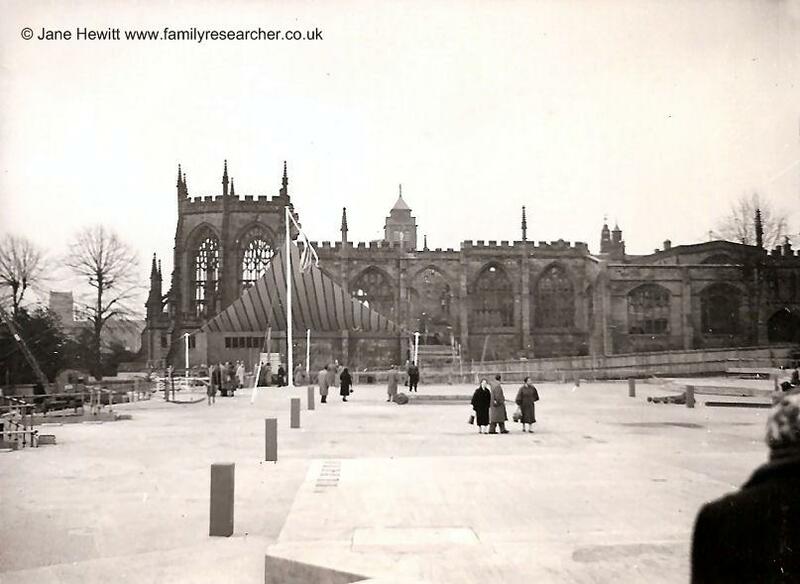 It shows the ruins of Coventry Cathedral in the background, fenced off from the area where the 'New Cathedral' would be built. Note that twelve years had passed since the actual bombing took place. Men, women and children can be seen in the foreground. 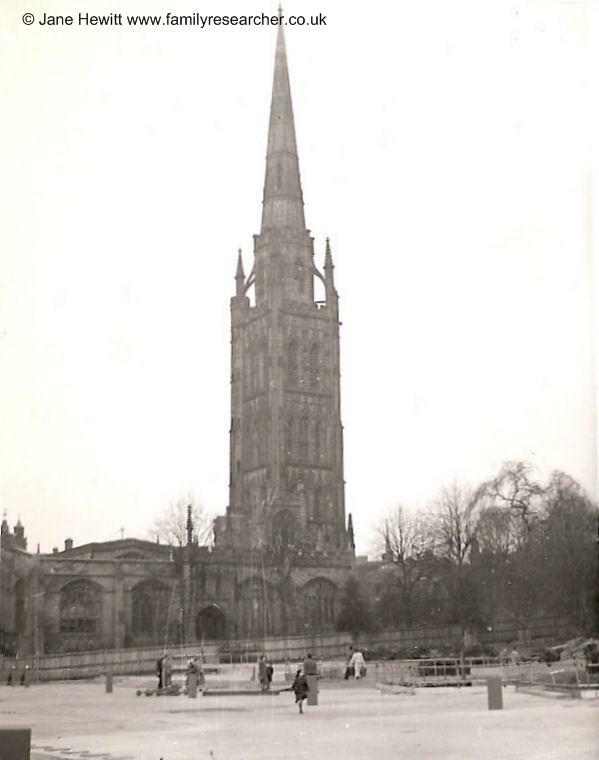 By 1955, fifteen years after the night of the Coventry blitz, you can see from the photograph to the right that the rebuilding of Coventry Cathedral was still progressing. The foundations of the Cathedral are now in place, and you can clearly make out the altar cross in the background. Aerial photo Coventry Cathedral site, 1955. 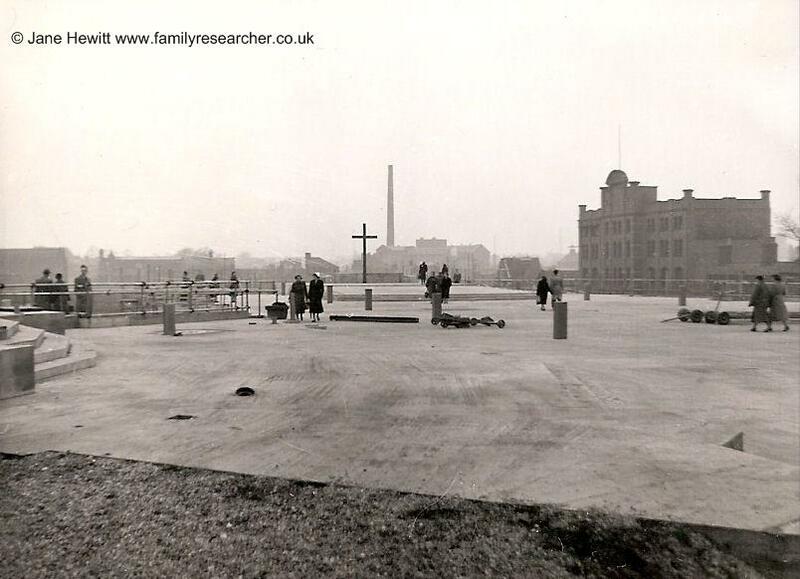 The rare aerial photo to the left, also taken in 1955, depicts the construction work in progress. You can clearly make out trenches and scaffolding as the new Cathedral begins to rise up out of the ashes of destruction. The Cathedral became a symbol of hope for peace. 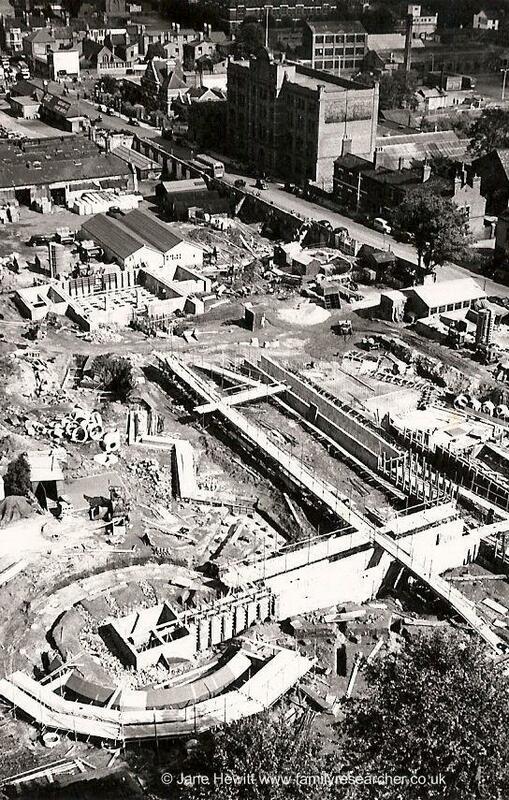 The 1956 photo to the right shows that construction of Coventry cathedral was still progressing. Members of the public can be seen walking about the site, and an awning has been erected, under which tables and chairs are just visible. The awning was erected in preparation for the Queen's visit in 1956 to lay the Foundation Stone. This final image is undated, but believed to be taken in the 1980s. 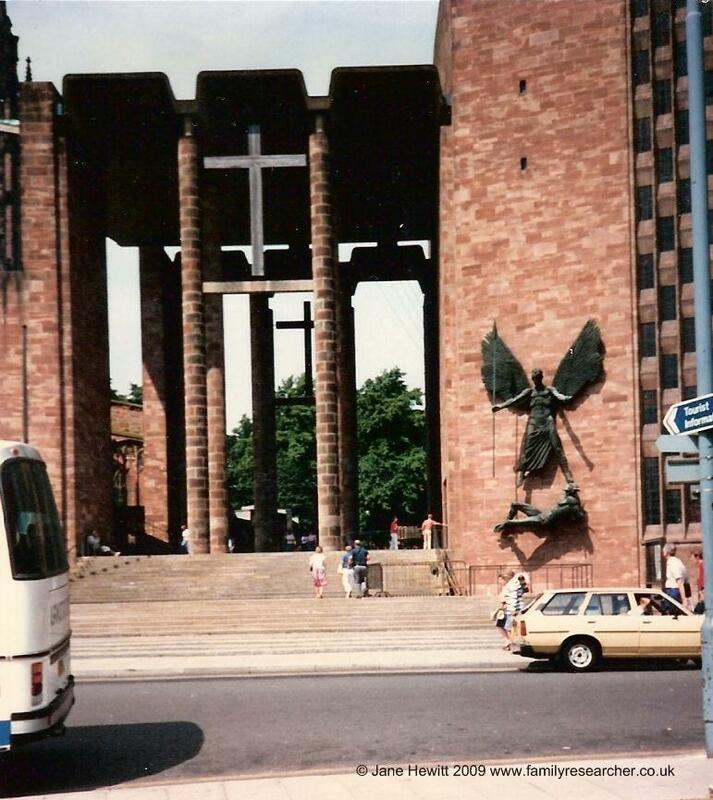 It shows the steps leading up to Coventry Cathedral, and the statue of St. Michael standing over the Devil. Despite the attention of bombs and planners, Coventry still contains many fascinating buildings whose history in stone, brick and concrete has shaped the last thousand years. It is home to one of the world’s best-loved cathedrals and possibly the country’s best Guildhall. It changed the modern world with Europe’s first pedestrian precinct and has the country’s first post-war theatre. Coventry’s medieval Spon Street contains many timbered houses, including more Wealden Houses than any other street in England. Coventry in 50 Buildings examines the proud and distinctive history of the city through a selection of its greatest architectural treasures. From the city’s modern cathedral, built after the destruction by the Luftwaffe of the original fourteenth-century building, to the impressive new extension to the Herbert Gallery, this unique study celebrates the town’s architectural heritage in a new and accessible way. Local author and historian David McGrory guides the reader on a tour of the city’s remaining historic buildings and modern architectural marvels.